This week’s “Giving Tuesday” Campaign at Texas A&M International University (TAMIU) shattered records and far surpassed expectations, organizers said. The initiative, part of an international day of giving that traditionally follows Cyber Monday, saw a 250% increase in donations to over $23,000 and an 80% growth in donors. Participation at all levels, from inside and outside the University, mushroomed. Rosanne Palacios, TAMIU vice president for Institutional Advancement, said the generosity of donors across the spectrum of the University community and the community at large was heartwarming. “During this season of giving, it’s truly heartwarming to see the generous support that spanned the spectrum of University students, faculty and staff, alumni and community partners. Donors could specify how they preferred that their gift be awarded, from scholarships to College or program support; but many simply suggested that their gift go to the area of greatest need. It’s been especially remarkable to be able to watch this generosity unfold online. We were especially impressed by the strong culture of giving that students are expressing – more than 39% of donors were current students,” Palacios noted. 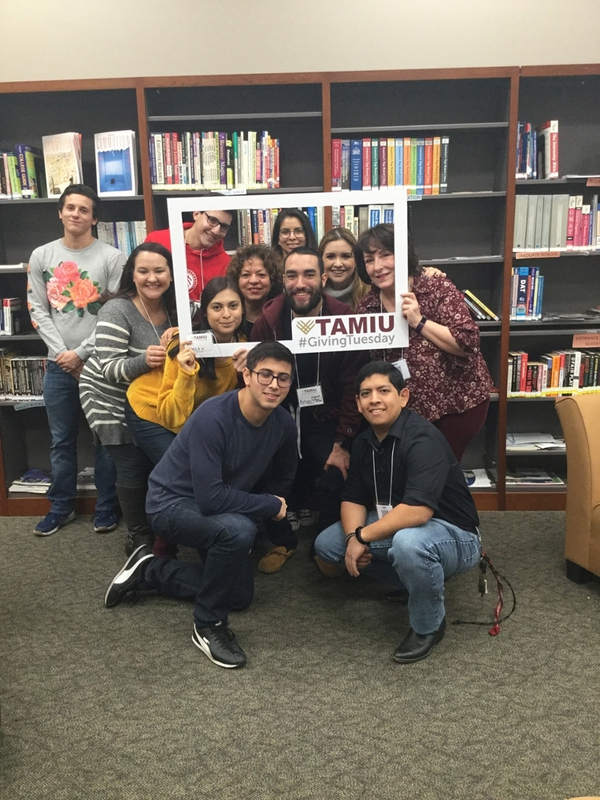 TAMIU’s Giving Tuesday campaign was driven by an aggressive web-based strategy and social media utilization, deploying advocate testimonial images and videos across social networks to encourage participation. Class challenges and generous matching gifts were announced throughout the day to further drive engagement, most of it taking place at individual smartphone, tablet or desktop level. Helping to drive engagement was a dedicated group of student event coordinators and members of the Student Philanthropy Council and the Student Philanthropy Ambassadors. Yelitza Howard, TAMIU director of Alumni Relations, said the use of technology was crucial to the campaign’s success. “We’ve fully embraced today’s technology and our TAMIU Giving Tuesday community responded to online challenges to amplify their gift, to be a part of a spirited College or School competition, and to proudly share their giving nature with friends and family…all with just a few quick clicks,” Howard said. The University has been staging the Giving Tuesday Campaign since 2015 with the partnership of the Alumni Association. Not including this week’s campaign, it has generated nearly $20,000 in TAMIU support. “It’s a fun campaign that give us a chance to call the ever-growing TAMIU community to action for this international day of giving. Through this, we empower our Alumni Association to respond to the University’s issues and opportunities. These gifts can support student financial aid, campus facilities upgrades, assist students with travel and research presentations with faculty, or to address greatest needs,” Howard noted. For additional information, contact Howard at 956.326.4483, email yelitza.howard@tamiu.edu or visit offices in the Sue and Radcliffe Killam Library, 260. For University information, visit tamiu.edu, email prmis@tamiu.edu, call 956.326.2180 or stop by offices in the Killam Library, room 268. University information is also found on its social media channels on Facebook, Instagram, LinkedIn, Twitter and YouTube. Helping to drive engagement in TAMIU's Giving Tuesday campaign was a dedicated group of student event coordinators and members of the Student Philanthropy Council and the Student Philanthropy Ambassadors.